In all the racing I’ve watched with the MU, the TV coverage shows us just enough to get the story across. When the winners get to the podium, we usually see them standing tall, stricken with the solemnity of winning. Some winners sniffle. A few shed tears. The podium girls kiss their cheeks, the UCI officials (I call them FIC in the book) shake their hands. Everyone waves their flowers and/or stuffed animals aloft. Then the cameras cut to the talking heads, usually Bob Rolle and Phil Liggett, who tell us how strong, brave, and wily the winners were. And so we miss some fun. Here’s Astana ProTeam, who won the opening team time trial (say that three times fast) of this year’s Vuelta de Espana. And well they should celebrate: the Vuelta is just as important as the Tour de France or the Giro d’Italia. Those of us on the other side of someone else’s decisions on race coverage might never have seen this. Christopher Nye, my journo in Spokes, has issues with trying to both cover the races and be elsewhere at the same time. Since I enjoyed piling problems on him, he should be grateful I didn’t find this picture earlier, and force him to explain to his editor why he missed mentioning such a joyful moment. 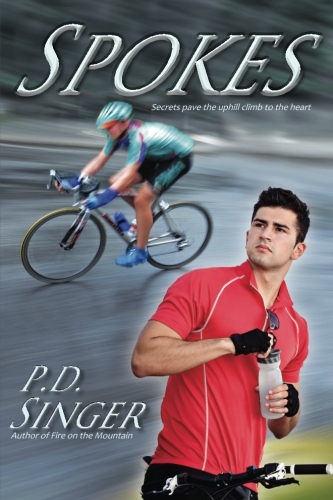 This entry was posted in Spokes and tagged new release, Spokes, winning. Bookmark the permalink.